100g of mixed silk fibres - our pick and mix selection. The picture is only representative of the selection you will receive and the contents may include some or all of the following - Silk Tops, Silk Laps, Silk Throwsters Waste, Silk Degummed Cocoons, Silk Mawata Caps, Silk Mawata Hankies, Silk Cut Cocoons and Silk Carrier Rods. SILK TOPS - A1 grade Mulberry Silk Tops A very luxurious fibre used for spinning, felt making, silk paper making and needle felting. SILK LAPS - Top quality Mulberry Silk Laps. Our silk laps are produced whilst carding the silk fibres to produce silk tops for spinning into yarn, consequently they have a similar staple length as the tops but with much more texture. 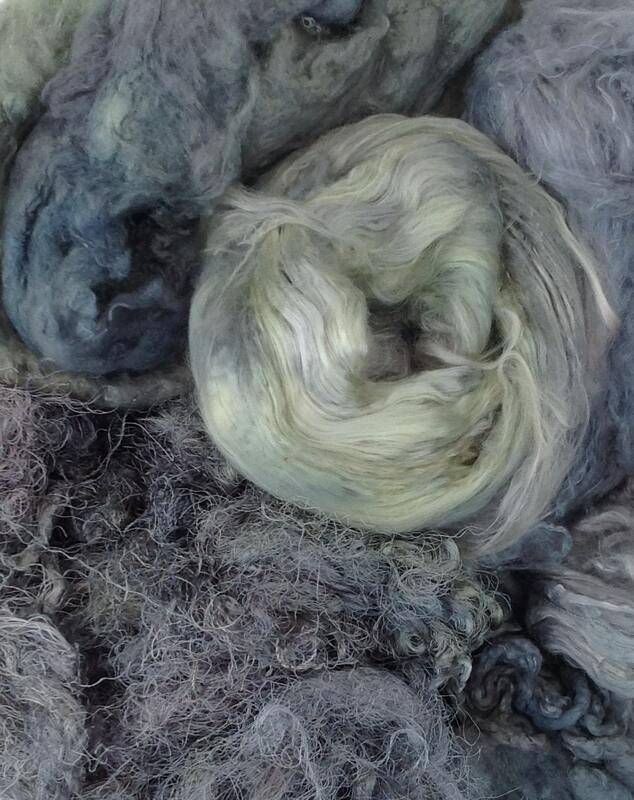 The silk fibres are fed into an industrial drum carder to be carded into silk sliver. At the end of the day the carder is all matted up (a bit like a hairbrush) the lap is then peeled from the drum in a flat sheet. A full lap measures about 4 feet by 8 feet, weighs approximately 1.2 kilos and is so called because it is one lap of the drum carder. The silk laps are especially good for felt makers to include with wool whilst wet felting to create added texture and lustre. The laps are also suitable for spinning into yarn, needefelting, silk paper making, mixed media techniques, embroidery and scrapbooking. SILK CUT COCOONS - The cocoon is spun by the silkworm in one continuous thread almost a mile long. The cocoons vary in size. Most of them are an oval shape with a hole cut in them. They can be cut, dyed, painted and sewn. Used in jewellery making, mixed media projects and embellishments. SILK THROWSTERS WASTE - A by-product of the twisting of filament in the reeled silk industry. It is unlike any other fibre on the market and an inexpensive source of high quality, long silk fibre. It can be handled in several ways to create textured or smooth, shiny yarns and can also be an inexpensive source of silk for blending. The curly texture of this fibre is a fun way to add texture and colour to your quilting, stitching, needle felting, silk papermaking (silk fusion) and other fibre arts. SILK DEGUMMED COCOONS - the silk cocoons from which the silk moths have emerged (as a consequence they are damaged and can not be unreeled) are degummed altogether in a mass. This is an unusual lumpy textured mass of silk. 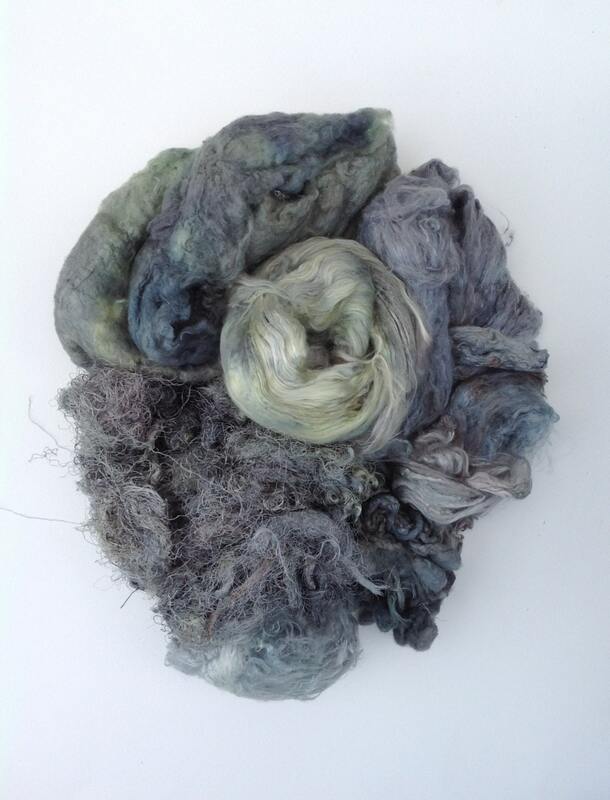 It can be spun, used for felt making or mixed media work. SILK MAWATA CAPS - silk cocoons that have been stretched into a cap shape - a cap can be made with up to 37 cocoons. SILK MAWATA HANKIES - hankies are silk cocoons that have been stretched over a frame into approximately a ten inch square. They can be used for spinning into yarn, needle felting, felting. SILK CARRIER RODS - These slit tubes are the by-product of reeling silk from the cocoon. Rods are approximately 5 - 6" (13–15cm) long. They are wonderfully textural for stitching, silk papermaking (silk fusion) and any embellishments. They can be pressed flat or pulled apart to reveal interesting criss-cross of the fibres. Also used for felting, weaving, embroidery or mixed media. They contain serecin - if sprayed with water, criss crossed over each other and ironed they stick together to form interesting "silk papers".